The PUR Classic 11-Cup Pitcher makes it easy to get clean, delicious water right from your fridge. Its built-in LED filter-life indicator lets you know when to change the MAXION filter, ensuring your pitcher is always providing the cleanest water possible. Changing your water filter regularly is crucial when it comes to removing contaminants, because a clean filter means clean water. It is recommended that pitcher filters be replaced every 40 gallons (or every two months) to maintain maximum contaminant removal. 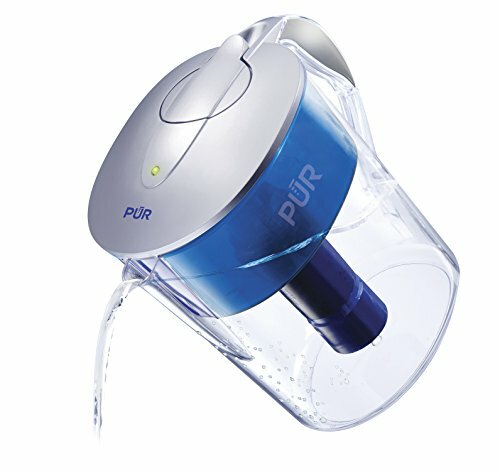 PUR CLASSIC WATER FILTRATION PITCHER: PUR's 11-cup water filter pitcher fits in your fridge for easy, quick access to cleaner drinking water. An electronic filter indicator light displays the filter status, so you know when it needs a replacement. PITCHER WATER FILTERS: PUR Basic pitcher filters are certified to reduce 22 contaminants. They provide 40 gallons of filtration (1-2 months of typical use). Only PUR pitcher filters are certified to reduce contaminants in PUR pitchers.